Final preparations for the launch of an Apollo mission began weeks in advance, when a 2,700-tonne diesel-powered crawler/transporter employing tracked tractor units derived from heavy open-cast mining equipment entered the 160-metre-tall vehicle assembly building (VAB), jacked itself up under a platform bearing a service tower and a complete but unfuelled Apollo/Saturn space vehicle - a combined load of 5,700 tonnes - and carried it out through one of the VAB's massive doors and along a 5^-kilometre crawlerway to one of two launch complexes, 39A or 39B, from which the rocket would make its fiery departure. The crawler/transporter was one element of a mobile launch system that had been inspired by members of Wernher von Braun's rocket team. 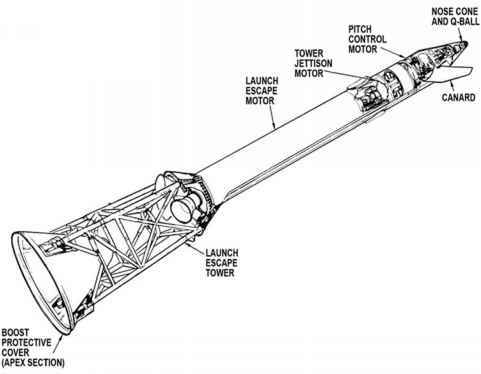 They had suggested that with a vehicle as large as a Saturn V, the task of stacking its stages and installing the Apollo spacecraft on top, would be best carried out inside a large hanger. 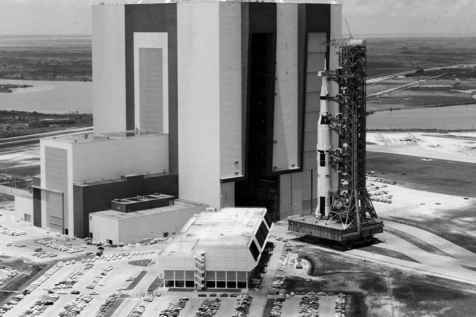 The resulting VAB was a huge box-shaped building 52 storeys tall at the focus of Kennedy Space Center, and it was within its cavernous halls that an Apollo/Saturn space vehicle came together for the first time. In a sense, it was from here that a journey to the Moon began. The Apollo 11 space vehicle leaving the VAB bound for Pad 39A. accelerating away from a rising rocket, and just as quickly braking to a halt before hitting the tower. With the VAB doors open, the crawler/transporter lifted the platform clear of six supporting pillars and carted the entire assemblage away at about 1.5 kilometres per hour. To accommodate the pressure of the crawler's 456 treads, each weighing nearly a tonne, a specialised roadway had to be constructed wherever it needed to go. A metre depth of support ballast formed a bed for a layer of aggregate that bore the immense weight of the crawler and its load as they were steered along their journey to the launch pads.